Stuffed away in a cupboard in my house is a box of vinyl 45s. Many of these singles are absolute classics and unavailable on CD. This is a poor situation and I’m determined to do something about it. So, from now on (or until I run out of 45s), I will post an MP3 of one of these great, lost 45s for the world to re-discover. 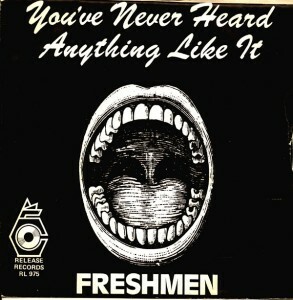 The first single is called “You’ve Never Heard Anything Like It” and is performed by The Freshmen, an Irish ‘showband’. The single was released in 1979 and was quickly picked-up by John Peel, who played it many times, becoming one of his favourite singles. I heard the track thanks to Peel and found it in a cheap singles box for the princely sum of 10p. It’s a swinging little number about a bored, fed-up teenager complaining about his family to an agony aunt. Full of lovely lines and a great chorus that you’ll soon want to join in with. According to one source, the single got as high as 17th in the Irish pop charts! Go on, download it. Play it, play it again and again. It’s a wonderful single. Any comments? Oh yeah, just noticed, they also have an entry on Wikipedia. Cheers for sharing. Got this up my loft somewhere! Great info on the band. John Peel was the gateway to new music at the time. Playing this again is like boarding a musical tardis. Hadn’t heard this before until they played it on rte radio 1 today!! Excellent. My favourite tune now. ? It’s a great tune, eh?